Something this heavenly shouldn’t be so easy, but it really is. I urge you to make it for someone who deserves it! The original idea for this cheesecake came from my mum when, many years ago I called her one evening for help with an idea for a pudding for a boy I fancied. She told me the basic recipe, which I wrote on a corner of the newspaper, with the phone wedged between my cheekbone and my shoulder. And of course the boy in question* couldn’t resist temptation when it was so beautifully presented to him on a plate. I don’t know where the scrap of paper is anymore but I don’t need it these days, as I have tinkered with this recipe so many times, it is etched into my mental memory banks for good. Even the coldest heart will melt when a slice of this dessert passes through their lips, so get cooking! First, the cathartic bit: put half the ginger biscuits into a strong freezer bag, seal it up tightly and then smash the biscuits to smithereens with a rolling pin. Transfer to a bowl and do the same to the other half of the biscuits, so they are reduced to a pile of crumbs, with perhaps a few larger pieces in for extra bite. Be careful during the smashing session that you don’t make a hole in the bag. If this happens, put the biscuits into a new bag and carry on. In a large pan melt the butter slowly, then add all the biscuits and stir thoroughly until the butter and biscuits are well combined and moist. The tin you will need for this cheesecake is a high-sided 9 inch loose-bottomed cake tin. I usually use silicon for all my baking, but have never had the balls to try it with this in case the base breaks when being removed from the tin. 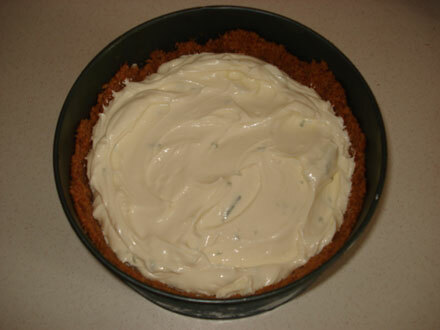 This cheesecake needs a solid tin, so my advice is to avoid silicon for this recipe. Grease the tin and then tightly pack the biscuit base into the tin and at least ¾ of the way up the sides of the tin too. It’s really important to do this, as this will hold the cheesecake together, and allow you to serve it without the tin. When the base is well pressed into the tin, drizzle the ginger syrup over the base and scatter the stem ginger pieces on the bottom so they are evenly distributed. Then put the base in the freezer to set while you make the filling. Leave it for at least half an hour, but an hour is best. Get a large mixing bowl and add all the cheeses and the condensed milk. Whisk it all together until it is completely smooth. Then add the lime juice and zest and whisk again until it is fully combined. You can taste the mixture at this stage and add more lime juice / cheese / condensed milk to suit your taste. The base is set when it is really hard and cold. It will not be this hard or cold when you serve it, but it needs to reach this state to be properly set. So, when it’s set, simply pour / spoon the mixture into the base, until it is about 1cm from the top of the base (NOT the tin). Don’t overfill it, or it won’t work. Then put it back into the freezer to set. You can leave your cheesecake in the freezer for 1 hour to 2 weeks, depending on when you plan to serve it. If your cheesecake has been in the freezer for more than 2 hours, you will need to get it out 1 hour before you want to serve it. It’s also important to take it carefully out of the tin as soon as you get it out of the freezer. This is when the base will be at its most firm, and therefore the least likely to break. To remove it, pass a knife very gently around the sides, separating the base from the tin. When it is all loosened, gently release the clip holding the bottom of the tin in place, and slowly put it onto its serving plate. *yes, of course it was Mr Rice. This mountain of chocolate brownies and white chocolate blondies (brownies made with white chocolate) is one of a trio of the best desserts I have made so far. They were as crunchy, chewy, sweet and chocolatey as they could be and they went down very well indeed. Melt the chocolate and butter in a large glass bowl over a pan of hot water (a bain marie). Make sure the bottom of the bowl stays out of the water, so the chocolate doesn’t burn. Stir it together until it is all blended, then simply add all the other ingredients and stir again until completely mixed. Finally, add the chocolate drops, give a quick stir and then transfer to a square silicon tin and cook at 180 degrees for 25-30 minutes. To make white chocolate blondies, just replace the 50g of dark chocolate and packet of chocolate drops with white chocolate. When it’s cooked it will be springy to the touch, but remember that the skewer test does not apply here, as you want the end result to be sticky and moist, not clean and dry like a cake. They will be crispy on top and gooey inside. Let the brownies cool a bit in the tin, then cut into pieces – as small or big as you like. There are so many varieties of chocolate brownie recipe around that much as I love this recipe, I have decided to try some of the others I have come across. Keep an eye on my new ‘chocolate brownies’ category for my latest brownie experiment. You are currently browsing the She likes her food blog archives for September, 2007.